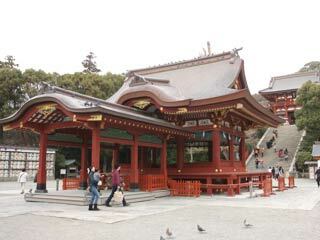 Tsurugaoka Hachimangu Shrine (鶴岡八幡宮) is one of the three major Hachimangu located in Kamakura. It is the most popular spot in Kamakura, especially, Yabusame in September is very famous. Tsurugaoka Hachimangu was built in 1063 and became the capital and center of Kamakura Government established by Minamoto no Yoritomo. There is no parking. Admission: free. Tsurugaoka Hachimangu was established by Minamoto no Yoriyoshi in 1063. He built the foundation of Minamoto Clan as militarists, Bushi, in the east Japan after suppression of the rebellion in 1062. He returned to Kamakura, and built a small shrine for Kami, god, of Hachiman near the seaside to thank for the success on suppression. The foundation of present Tsurugaoka Hachimangu was established by Yoriyoshi's descendant, Minamoto no Yoritomo (源頼朝), as the head of Minamoto clan. He came to Kamakura to rise up against Taira clan in 1180, because Kamakura was a special place for him that his great ancestor achieved the suppression of rebellion. He moved the shrine to present site and built more magnificent shrine. This new shrine called Tsurugaoka Wakamiya means the new shrine at Tsurugaoka. At the time, Heian period was coming to the end, and power of nobles were transferred to the military, Bushi, class. The conflict between Taira and Minamoto clans resulted in the vicotry of Minamoto clan, and establishment of Kamakura Govornment consequently. In 1192, Yoritomo was appointed to the shogun and founded Kamakura Government, also known as Kamakura Shogunate. Kamkura Government is the first samurai regime throughout Japanese history. This samurai-regime system lasted until the endo of Tokugawa Government in 1867. Thus it can be said that he made the foundation of samurai era. He has been respected as an ideal and prominent leader in Japan, and Tsurugaoka Hachimangu also has been regarded as a religious foothold for these Shogunates. He developed Kamakura city as a capital, and set Tsurugaoka Hachimangu in the central of the city. Thus, Tsurugaoka Hachimangu was compared with the Imperial Court in Kyoto. When the Kamakura city was the capital of Japan, Tsurugaoka Hachimangu played important role not only as a religious foothold but als as a parliament. Many majestic rituals has been held in Tsurugaoka Hachimangu by the Shogunate, but also this shrine used as the political centre. Tsurugaoka Hachimangu was built on Yoritomo's faith and respect for his ancestors' achievement. Yoritomo's devotional behavior to Tsurugaoka Hachimangu was thought to be a good manner for next Shogun and Samurai. Many Shogun and their followers worship Tsurugaoka Hachimangu as Yoritomo done, and built shrines for Hachiman deity in various location in throughout Japan.